It’s looking iffy whether the Republicans can prevent President Obama’s reelection with a Tea Party-approved candidate. So let’s change the rules. First, change the way electoral votes are tallied. Nebraska and Pennsylvania are headed this way. In Nebraska electoral votes are awarded congressional district-by-district. Obama carried Omaha in 2008, so earned one of Nebraska’s five votes. Nebraska appears headed for a winner-take-all system that would deny Obama that one vote. Pennsylvania is a bigger deal. Obama carried the state in 2008, and its 21 electoral votes under winner-take-all rules. It is headed for a district-by district award—yes, the system Nebraska is abandoning—under which Obama would have only gotten 11 of Pennsylvania’s 21 votes in 2008. So we could see a Republican gain of 10 votes in Pennsylvania and one in Nebraska—enough to swing a close election. But Republicans can improve the odds a lot more by making it harder for students, minorities, and low income people to vote at all. To this end Republican-controlled state legislatures in Florida, Ohio, and Wisconsin are moving to trim early voting days. Early voters are disproportionally Democrat. If that’s still not enough to insure a Republican victory, legislators in 20 states are considering tighter ID requirements, including requiring a government-issued photo ID. Guess who don’t have photo IDs: lots of students, minorities, and poor people. Who might they vote for? As things are heading we’ll never know because they won’t be allowed to vote. And in the name of reducing voter fraud, Florida has made the process of registering new voters so cumbersome that even the League of Women Voters decided to end its long-standing service of registering voters. This entry was posted on September 19, 2011 at 11:31 pm and is filed under Ethics-general, Government, Politics. You can follow any responses to this entry through the RSS 2.0 feed. You can leave a response, or trackback from your own site. Repubs have to stop playing “Good Guy”, Dem’s have lied, cheated, stolen, and bamboozled the naive and uninformed voters for decades. Not saying GOP needs to adopt Chicago style politics, but growing a pair would be nice. Yeah, what our country needs is for those naive and uninformed voters to stay away from the polls. Then we sophisticated and informed voters can elect our own. The National Popular Vote bill is a state-based approach. It preserves the constitutionall y mandated Electoral College and state control of elections. 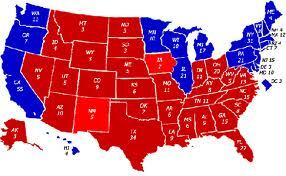 It changes the way electoral votes are awarded in the Electoral College. It assures that every vote is equal and that every voter will matter in every state in every presidential election, as in virtually every other election in the country. Under National Popular Vote, every vote, everywhere, would be politically relevant and equal in every presidential election. Every vote would be included in the national count. The candidate with the most popular votes in all 50 states would get the 270+ electoral votes from the enacting states. That majority of electoral votes guarantees the candidate with the most popular votes in all 50 states wins the presidency. Given the choice, most Pennsylvania and U.S. voters want to change to a national popular vote. National Popular Vote would give a voice to the minority party voters in each state and district (in ME and NE). Now their votes are counted only for the candidate they did not vote for. Now they don’t matter to their candidate. With National Popular Vote, every vote, everywhere would be counted for and directly assist the candidate for whom it was cast. In Gallup polls since 1944, only about 20% of the public has supported the current system of awarding all of a state’s electoral votes to the presidential candidate who receives the most votes in each separate state (with about 70% opposed and about 10% undecided). A Washington Post, Kaiser Family Foundation, and Harvard University poll shows 72% support for direct nationwide election of the President. Support is strong among Republican voters, Democratic voters, and independent voters, as well as every demographic group surveyed in virtually every state surveyed in recent polls in closely divided Battleground states: CO– 68%, IA –75%, MI– 73%, MO– 70%, NH– 69%, NV– 72%, NM– 76%, NC– 74%, OH– 70%, PA — 78%, VA — 74%, and WI — 71%; in Small states (3 to 5 electoral votes): AK – 70%, DC – 76%, DE –75%, ME — 77%, NE — 74%, NH –69%, NV — 72%, NM — 76%, RI — 74%, and VT — 75%; in Southern and Border states: AR –80%, KY — 80%, MS –77%, MO — 70%, NC — 74%, and VA — 74%; and in other states polled: CA — 70%, CT — 74% , MA — 73%, MN – 75%, NY — 79%, WA — 77%, and WV- 81%. Most voters don’t care whether their candidate wins or loses in their state or district… they care whether he/she wins the White House. Voters want to know, that even if they were on the losing side, their vote actually was directly and equally counted and mattered to their candidate. Most Americans consider the idea of the candidate with the most popular votes being declared a loser detestable. The bill has passed 31 state legislativ­e chambers, in 21 small, medium-sma­ll, medium, and large states, including one house in AR, CT, DE, DC, ME, MI, NV, NM, NY, NC, and OR, and both houses in CA, CO, HI, IL, NJ, MD, MA, RI, VT, and WA. The bill has been enacted by DC (3), HI (4), IL (19), NJ (14), MD (11), MA (10), CA (55), VT (3), and WA (13). These 9 jurisdicti­ons possess 132 electoral votes — 49% of the 270 necessary to bring the law into effect.